Home » Academic Freedom » Why Is a Math Professor at Wellesley So Hard Hitting against an Economics Professor Fired by Peking University in China? Why Is a Math Professor at Wellesley So Hard Hitting against an Economics Professor Fired by Peking University in China? To be sure, there is nothing wrong about a math professor—or a marine biologist, an astronaut, an alchemist, for that matter–speaking out against Professor Xia Yeliang, defending Peking University’s decision to fire the professor of Economics who “happens to be” a dissident and a critic of the communist regime, and lashing out at his Wellesley colleagues for their support of professor Xia. Professor Xia Yeliang gave a lecture. A screen shot of Silent Contest. For those of you who have not been following news from China that closely, here is a quick review of the Professor Xia Yeliang Incident: Professor Xia is a professor of economics at Peking University. On October 18, the university notified him that a faculty committee voted not to renew his contract. 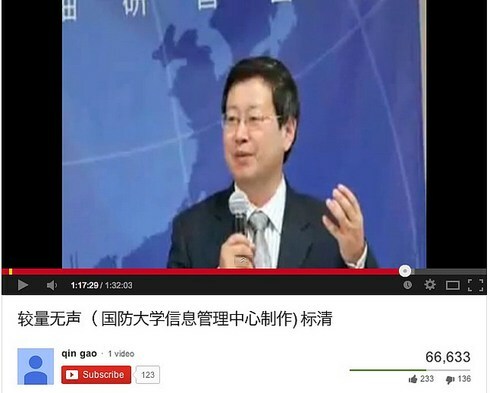 Professor Xia’s firing made international news because it so happened that he has also been an outspoken critic of the Chinese Communist Party (CCP) regime in China, and one of the first signatories of Charter 08, a proposal for political change in China initiated by Liu Xiaobo that landed him in jail for “subverting the state power” (He now enjoys the rare distinction of being the only jailed Nobel Peace Prize winner in in the world). An ultra-anti-American, anti-West film titled Silent Contest, produced by the Chinese military that has been available recently, portrayed him as an enemy of the state along with other liberal intellectuals. The New York Times published an editorial to put the dismissal of Professor Xia Yeliang in the larger picture, an insidious pattern, of China’s effort to suppress academic freedom and political dissent. Peking University, as well as state media, reacted promptly, declaring the decision to fire Professor Xia had nothing to do with politics and everything to do with how poor a teacher he had been and how poorly the students thought of him. A debate unfolded among many foreign journalists and China watchers. Mr. Eric Fish wrote in the Atlantic, on October 22, dismissing the outcries of American journalists and academics. He pointed out that no one had bothered to go to the university to talk to the students and find out what they had to say about Professor Xia. So he did. He didn’t explain how he found his samples (I wish he did and I actually asked him to do so on Twitter, given how diverse his samples were and how quickly he was able to identify, and talk to, them over a weekend), but he seemed to have found the near perfect sampling to reach his conclusion: Even in China, Dissidents Sometimes Get Fired Just for Being Bad at Their Jobs. Another prompt response, largely unnoticed by English speakers, came from a “full professor of mathematics at Wellesley College” by the name Bu Qiyue (步起跃), and it was published almost simultaneously (within less than an hour) on the websites of Xinhua News Agency (Chinese), People’s Daily (Chinese) and CCTV website (Chinese) the essential mouthpieces of the Chinese Communist Party. I only read the article, written in Boston on October 21, this weekend. I would imagine Professor Bu doesn’t know either what was going on at the School of Economics of Peking University from Boston. He didn’t seem to think he is making the same mistake of listening to one side only when he quoted the decision of the School’s Faculty Evaluation and Appointment Committee to make his counter argument. While the side that supported Professor Xia has a well-documented pattern of suppression from which to draw their conclusions, the fact remains that in Peking University, there are plenty of inept professors who comfortably keep their jobs even though they are hated by students. I know this because I was a student there. Really? Chinese intellectuals and young people hate the New York Times? That’s news to me. I do know that China’s Great Fire Wall blocks all the sites of foreign media and social media such as Twitter and Facebook, and has long been using tactics to obstruct the work of foreign journalists in China from denying visas to outright personal threats. Now, I’m really scared to reach the end of Professor Bu’s paragraphs. What a stop. Professor Bu is right about that there have been many outspoken faculty members in Peking University, but that’s a quality, and courage, of these faculty members and not by the sanction of the university authority, which, as all universities in China, is under the strict control of the CCP. The truth is, free thinking has always been monitored closely and insidiously trammeled through varying methods. One of which is student reporting. Some of Professor Xia Yeliang’s students “complained” to school officials about him talking about the political and economic disasters in the Mao Zedong era in the classroom. This spring, the CCP stepped up control over university teaching by issuing a gag order to universities, known as the “7 no-mentions” (七不讲), that bars discussion of Western constitutional democracy, universal values of human rights, media independence, civil society, pro-market neo-liberalism, and nihilist criticisms of the party’s traumatic past. I don’t know what time span the word “ever” covers when Professor Bu says “Nobody has ever been fired for political reasons.” It’s a ridiculous untruth if we go back to the 1950s, a terrible lie if we go back to the 1960 and 1970s, and a willful whitewash if we consider the faculties and students who were “disciplined,” fired, or put in jail in the wake of the Tian’anmen square democracy movement, from which Professor Bu might be a beneficiary. I digressed. Readers interested in researching more examples of political persecution at Peking University in the 1990s can look up these names: Chen Po (陈波, Department of International Studies), Wang Tiancheng (王天成, Department of Law), and Yuan Hongbing (袁红冰, Department of Law). I took pains to translate Professor Jiao’s explanation in order to show that, obstruction of academic freedom and punishment of political dissent come in different forms – often in more insidious forms than outright expulsion, such as secret monitoring and reporting by student party members, warning, non-promotion, teaching ban (Chinese), etc. This is particularly true today when Chinese universities are seeking more and more international alliances and trying to raise their profiles while benefiting from top-tier researchers around the world. They need to make their foreign counterparts believe they have academic freedoms, and they cannot afford to fire professors one after another for political reasons without losing their coveted “international cooperation.” For example, someone argued that, “Look, Peking University has not fired Professor He Weifang (贺卫方), and that goes to show Professor Xia Yeliang wasn’t fired for political reasons.” Well, no, the most obvious reason for keeping Professor He Weifang would be that Peking University will lose an arm or leg if they fire Professor He Weifang. Has He Weifang been pressured over the years? Google it for yourself, or better yet, talk to him. On November 3rd, Professor Bu wrote again on the topic, this time in a letter to The Chronicle of Higher Education to bring its attention to the “only article from the U.S. that offered balanced view,” the Eric Fish piece in The Atlantic. In all three articles, Professor Bu cited how important the Sino-US relationship is and what a success the partnership between Wellesley College and Peking University has been and must continue. Well, Wellesley faculties have already voted to continue that partnership and no one in the world thinks the Sino-US relationship is unimportant. Professor Bu must have breathed a sigh of relief. Now, has Professor Bu been writing as someone, anyone, who just happens to have an opinion about the matter, or is there more to it? In April of this year, the website of Chinese Communist Party Changzhou Committee’s Department of United Front Work published a feature story (Chinese) about Professor Bu, titled Changzhou Bu Qiyue: Rewrite the History of a Famous American University. We learned that he was the first Chinese to become the Chair of the Board of Admissions at Wellesley; that among Wellesley’s many distinguished alumni are two Secretaries of the State, Albright and Hillary Clinton, as well as Soong May-ling, wife of Chiang Kai-shek, and Bing Xin, a prominent Chinese writer of the last generation; and that Professor Bu has been retained as an “overseas commissioner” of The Federation of Overseas Chinese of Changzhou since 2006. We also learned from the same article that Professor Bu and his family had once been received by a ministerial level Chinese official with a banquet at Diaoyutai State Guesthouse (钓鱼台国宾馆), the place where Chinese government receives foreign leaders and dignitaries. That’s really impressive for a non-Nobel winner overseas Chinese. Has Professor Bu solved any crazy problem the like of Goldbach Conjecture? The common impression you get from reading Chinese newspapers is that Nobelists of Chinese descent and math supermen get that kind of treatment, but apparently Chinese leaders befriend other types too. As recently as last month, Professor Bu was received by the deputy director and Chairman of CCP Changzhou’s Department of United Front Work and the chairman of The Federation of Overseas Chinese of Changzhou. 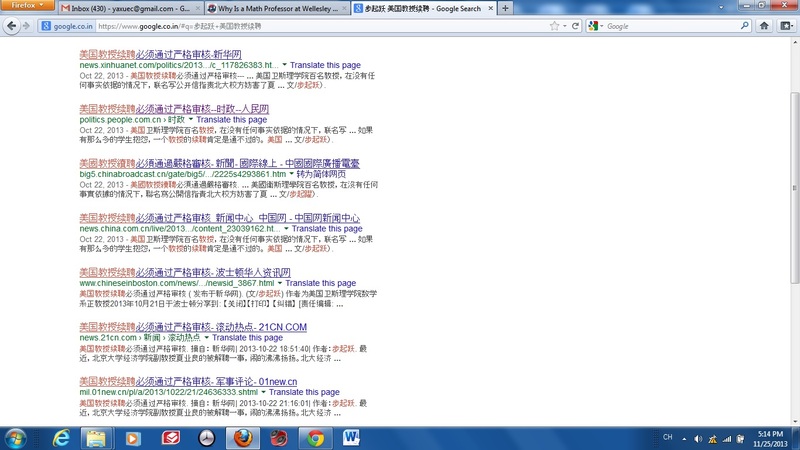 A screenshot of the search result of Professor Bu’s article. In any case, I wonder, what channels one must go through, and what kind of coordination it takes, for an article by someone outside the Chinese government’s propaganda system on its very top level, and even outside China, to be posted not only on the site of China’s three most prominent propaganda organs almost simultaneously, but almost all other major state-owned media outlets as well, including Global Times (环球时报), China News (中新社), China Radio International (中国国际广播电台), and even a military site and many more? When I posed this question on Twitter, a tweep pointed out that, while Xinhua, People’s Daily and CCTV are all mouthpieces, they administratively belong to the State Council, the CCP Central Committee, and the State Administration of Radio, Film and Television respectively, and the only authority that can get all media outlets to do something concertedly is the CCP’s Department of Propaganda. As I researched for this article over the weekend, I learned that Wellesley’s Freedom Project is going to invite Professor Xia Yeliang to be a visiting fellow. I hope this materializes. It looks like Wellesley could be having more arguments over Mr. Xia where he has strong supporters and also at least one formidable detractor. Writing this post, my hope is that Professor Bu, in future discussions of Professor Xia, will be forthcoming about his close ties with CCP and the Chinese government. Nothing is wrong with having such ties, right? But many will agree that it is problematic to hold back such extraordinary ties from his Wellesley colleagues while criticizing their support for Mr. Xia, and Professor Bu owes his colleagues some perspective and balance. The following is a response from Mr. Eric Fish. When I wrote this piece, I was not aware of what he had subsequently written about the topic since his Atlantic piece. The only reason I mentioned his article at all is because it has some relevance to my discussion of Professor Bu. Ah how easy it is for misrepresentations to flow and outright falsehoods to be reported when you don’t bother seeking comment from someone before putting words in their mouth. Amazingly, literally every word said about me (Eric Fish) in this piece managed to be false. Secondly, as I’ve repeated probably at least a hundred times since that piece came out, I never “dismissed the outcries of American journalists and academics.” I don’t at all rule out that politics played a factor. But things tend to be a bit more complicated than the simple “bad teaching OR political persecution” false contradiction that’s dominated the debate on this issue. In my piece, I just reported what students said and devoted about half my article to Xia’s side of the story. Thirdly, I never said “no one bothered to go to the university.” I said very few did. I know Andrew Jacobs talked to some current students prior to my piece, but I wasn’t so interested in talking to current students. Xia has known since the beginning of summer that this vote was coming up. If it were me, I’d dramatically change my teaching methods, so I wanted to contact students going back several years. And as it turns out, journalists Valentina Luo, Helen Gao AND Andrew Jacobs have since also found students saying the same things I found. Fourthly, I didn’t find my sources “in a weekend.” I started looking a few days before Xia was officially fired because that’s when a random conversation with a PKU student alerted me to this story. Altogether I think it took about 5 days. By China Change in Academic Freedom, Human Rights & Civil Rights, Reports on November 25, 2013 . Regardless of Prof. Bu’s political leanings, it’s almost certain that he knows far more about Xia Yeliang and PKU than his colleagues. What’s funny in the whole matter is that a hundred of college intellectuals who knows almost nothing about person or set foot in the country feels qualified to judge a situation based on some hearsays. No, Prof. Charles Bu only repeats what PKU officials say. He has no independent information. He’s one sided. Worse, he’s under the impression that there’s freedom of expression in Chinese universities and that no scholars have ever been fired for political reasons. The above article lists the names of a half dozen PKU scholars who have been fired. Countless others have been punished. Countless others remain silent because they’re afraid to speak out. Is Bu lying when he says that no one has been fired, or is he ignorant about his own country? Either way, it doesn’t make him look good. Your logic seems flawed. From Prof. Bu’s short biography on his Wellesley College website (http://www.wellesley.edu/math/faculty/buc), it does not appear that Prof. Bu has studied or worked at Peking University. So he is probably an outsider as far as Peking University is concerned (of course, under normal circumstances). Knowing the caliber of faculty at elite colleges in the U.S., I highly doubt that the 100+ Wellesley faculty members who signed the open letter were judging “a situation based on some hearsays.” Did you come to that conclusion based on some “hearsays”? Thank you for this excellent piece. I was in Beijing when this was unfolding. I asked every Chinese academic I met on the trip — and it was an academic trip so I met many — what they thought. I observed an interesting pattern to the responses. The first response was to say that Peking U’s claim about Xia’s teaching is credible and I should believe it. By the end of the conversation, each person said a variant of “If he had never criticized the Party, he would have never been fired. Nobody is ever fired just for bad teaching.” What Eric Fish, in his surprisingly angry and righteous response to you, says is true: it’s not either/or. Bad Teaching or Incorrect Politics. But he stops too soon with this insight and doesn’t spell out what seems quite apparent: that it’s perfectly plausible that Xia’s teaching was not popular with students and that they fired him for political reasons. As one Chinese scholar told me, “Xia was not famous enough to be critical of the party. If he were more famous, he could have gotten away with it.” This person then mentioned He Weifang as someone who has been able to criticize the party, although I’m not sure it’s accurate to say that he’s “gotten away with it” as he was reassigned to a University in Xinjiang. Thank you for your thoughtful and well-informed analysis Yaoxue. I was dismayed when I read Professor Bu’s letter in the Times and it’s very interesting for me to know that his thoughts were published by the main China outlets as well. Thank you. I must say I wish you were writing for The Atlantic rather than Eric Fish. Hi Jennifer, thank you for you comment. It contributes greatly towards a better understanding of the events. I was not aware that Professor Bu also wrote on the Times. I would have mentioned it in my article. I did a search on the NYTimes site and nothing showed up. Can you give us a link? I would have sworn I saw Bu’s letter in the NYTimes but I just tried to find it and couldn’t. It must have been the Chronicle letter I saw. Sorry for the confusion. Thanks again for a great piece. I do not believe that Eric Fish did due diligence. He would need to have gotten data on how many full professors have not been renewed over the last decade. A sampling of students tells us that a sampling of students don’t like Xia’s teaching but it tells us little else. Sometimes, with China, it feels like people bend over backwards to be “objective.” But bending over backwards actually ends up yielding an upside-down view! Given Document 9, given that propaganda film, given countless examples of political suppression, and given what I heard from a number of professors (a few of whom either graduated from or who teach at Peking U), your perspective is the more objective one. Well-informed and timely piece from Yaxue Cao about an apparatchik-like math professor who has no apparent understanding of the principle of academic freedom, but has been bending over backwards to toe the Party-state’s party line and become attain fame in China’s state-run media. Q: What are the chances for someone to submit an opinion piece about the dismissal of a professor to Xinhua website, to be accepted and published, and then to be reposted unanimously, without coordination, by all of the top-tier state-owned media websites in China in one evening? Q: With an article like Professor Bu’s, what channels must it go through, and what kind of coordination does it take, to be published by Xinhua, and then reposted by virtually all other major outlets? A: Such uniform reposting across the board has to be the result of an order, and of an engineered “opinion war.” It’s a very common practice. For example, toward the end of the Southern Weekend incident [earlier this year], the CCP Propaganda Department ordered all municipal newspapers to repost a Global Times editorial. In another two cases, we saw the same practice where media outlets were ordered to repost Wang Xiaoshi’s (王小石) article titled If China Plunges into Turmoil, It Will End up Worse than the Soviet Union (《中国若动荡，只会比苏联更惨》) and Zhou Xiaoping’s (周小平) article Please Don’t Squander This Era (《请不要辜负这个时代》). This time it was used against Xia Yeliang. The websites you listed are all top tier websites. Procedurally, the order would come from the State Council Information Office (国务院新闻办公室). In China, there are two systems of propaganda organs. One is the party system, and the other the government system. The Propaganda Department is of the Party system that takes charge of newspapers and periodicals, while the State Council Information Office is of the government system that takes charge of websites. Since the Internet media flourished, the two systems have established a joint command mechanism with a coordination office — the State Internet Information Office, led by Lu Wei (鲁炜). It is useless, pretentious, and dishonest to discuss academic freedom at PKU isolated as if a university in China can possibly be an oasis in a desert of relentless, top-down censorship. On November 15, the government shut down PKU law professor Zhang Qianfan’s (张千帆) Sina Weibo account and his blogs at sohu.com, caixin.com, 163.com, caijing.com.cn, qzone.qq.com. (Tencent Weibo notified Professor Zhang Ming at Renmin University of China that “you are permanently barred from speaking.”) A constitution scholar who wants to speak and write is now left without a venue to do so inside China. That’s the reality, and the government doesn’t even feel they have to give a reason for taking away a citizen’s right to speak. Are we a bunch of actors and actresses when duck our heads together to talk about academic freedom at PKU, or any university in China for that matter, without first talking about the apparatus that operates it? Thanks again Yaxue. More important information. I am very glad to learn the details of how things work from the veteran journalist. I brought up academic freedom when I commented on Eric Fish’s site Sinostand but I agree with you that it is pretentious to talk about academic freedom in the context of China. I’m not sure, though, that it’s useless. What I’ve found — time and again — is that if you try to take too strong a stand on the lack of political (and, thus, academic) freedom, you will be tuned out. Isn’t it better for pushing the conversation forward to say, okay, so let’s say that PU can back up its claims about XIa’s teaching and let’s say that it did have legitimate reasons for dismissing him and let’s acknowledge that it claims to honor academic freedom, now where are we on all this? At this point, we can start to point out all the ways that “academic freedom” does not even begin to have the same supports in China than in the US. We can begin to say, What is academic freedom when a party secretary is involved in academic decisions? What is academic freedom when scholars must get government permission to hold conferences? What is academic freedom when the government can issue a Document that declares huge and vital topics — including major events in history! — off limits in the classroom? What is academic freedom when professors and students always know that there is likely a student in the classroom who will report on politically suspect comments? What is academic freedom when professors see the career repercussions suffered by their peers when they speak on controversial subjects? Academic freedom is most definitely a farce in China but there’s still a lot worth discussing here, so that the discussion continues to deepen, no? In the States, fewer and fewer of us have access to tenure and so access to a strong version of academic freedom. It is imperiled here, too. We have it and we’re losing it. China simply doesn’t have it. That some universities want to pay lip service to the idea, though, is something to use and build on . . .
What could the scenarios be that resulted in the Xinhua website posting Professor Bu’s article at 18:38:32 and the website of People’s Daily overseas edition posting the same article, from Xinhua, between 18:38:33 — 18:38:59? This is the “Less-Than-28-Seconds” question. In the article (also linked in my article) published as recently as October 16 titled Changzhou Municipal Federation of Overseas Chinese Received Its Overseas Commissioner Bu Qiyue, Professor Bu is referred to as the chair of Mathematics Department at Wellesley. In the article (also linked in my article) published in April this year, Professor Bu is described as “the only Chinese to chair the the Board of Admissions in Wellesley’s 120-year history” without specifying the years when he was in that position. I suppose this is a factual description. From the article, we learned that Professor Bu was involving in recruiting students from mainland China for Wellesley. Perhaps there was a misunderstanding on the part of the Changzhou officials who received Professor Bu. I think translating the Board of Admissions to “招生委员会” is fine. Professor Bu could have served as a faculty member on the Board of Admissions in the past (as you can see on the following Wellesley website that currently 12 faculty members serve on that committee for three-year terms, in addition to several other faculty members who are designees of Senior Staff members: http://www.wellesley.edu/provost/committees). Also, he could have been involved with recruiting students from China while a member of the Admissions Board, given that he is from China and is familiar with the language and culture there. Unfortunately, “招生委员会主席” — an impressive sounding title indeed — could be interpreted as the head of admissions, which would be terribly misleading. If he were the head of admissions, then the “rewriting history” part of his hometown article would have made some sense. Other wise, some people got completely carried away with hometown-boy-makes-good, to say the least. Maybe this is just a common practice in many walks of life in China these days, but it is sad to see that it involves people in the educational sector, too. Thank you for this very insightful, interesting, and well-written article! correction. Dr. Martin Luther King was also a Nobel Peace Prize writer, whom was jailed.